David H. Keller (b. 1880 - d. 1966) was a psychiatrist and science fiction / fantasy / horror author. He earned his M.D. 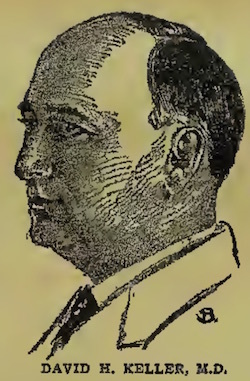 from the University of Pennsylvania in 1903. He served in the US Army Medical Corps during WWI and WWII as a neuropsychiatrist. He also used the pseudonym Henry Cecil. It's a small start, but when they're working on robotic nurses in Saskatoon, you're going to need to get serious about robots. PaPeRo, iRobi, Jupiter, Qrio - are these excessively cute robots the roboticists answer to Mary Poppins? Or a danger? You be the judge. There's always something on the drawing board at the Japan Aerospace Exploration Agency; this time, it's a very personal space toilet. If you have one of those kids who just don't sleep well, there's this mechanical baby bed. This little bot is just a prototype, but imagine if you will a little household medical robot that follows your elderly mother-in-law around the house. A top hospital tweeter? Collectively. 'In every diaper there is a fine copper wire...'- David H. Keller, 1928. 'In every diaper there is a fine copper wire. '- David H. Keller, 1928. 'Every diaper... a fine copper wire…' - David H. Keller, 1928. 'Large laboratories in every city had produced synthetic food and meats, grown in large test tubes..." - David H. Keller, 1933. 'That gives it complete isolation.' - David H. Keller, 1932. 'Laboratories in every city had produced synthetic food and meats, grown in large test tubes...' - David H. Keller, 1933.